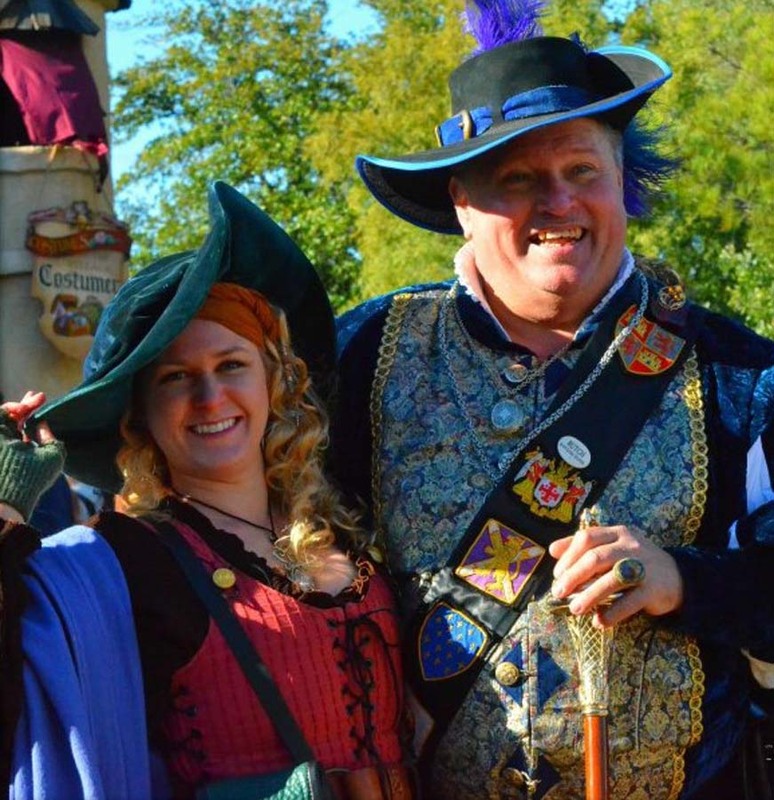 Renaissance Faire, LARP, SCA, Royal Faires, Medieval Festival, Celtic Festivals, Pirate Day, and other themed Fairs are more fun to attend in costume. 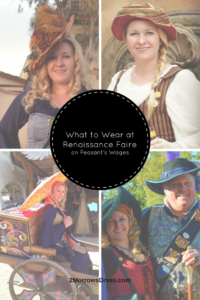 Here is my Beginner’s Guide on What to Wear at the Renaissance Faire on a peasant’s wage. Many Renaissance Festival locations have a costume rental booth. This was a low cost option for my nieces on their first visit. I recommend arriving early to ensure the most options and to avoid feeling like “the good costumes are gone”. For around $30 each, both girls picked out an outfit complete with hat to wear for the day. This made the entire experience more fun for them, and it was a cheaper one time cost than buying. 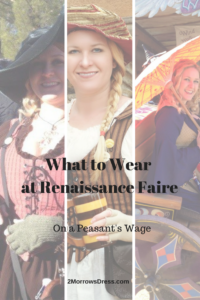 If you plan to attend and dress up for Faire more than once, it is less expensive to buy a children’s outfit rather than rent. You can typically buy an outfit for less than the cost of two rentals. Most costumes for children will be adjustable for growth over a couple years. Adult costume rental is more expensive and the outfits available can usually be purchased ahead of time for about the same cost. Before renting an adult costume, take a quick stroll through the shops, you may be able to find an inexpensive outfit to keep the cost around (or slightly more) than the rental expense. Peasant outfits are the least expensive, most comfortable, and easiest to mix and match. 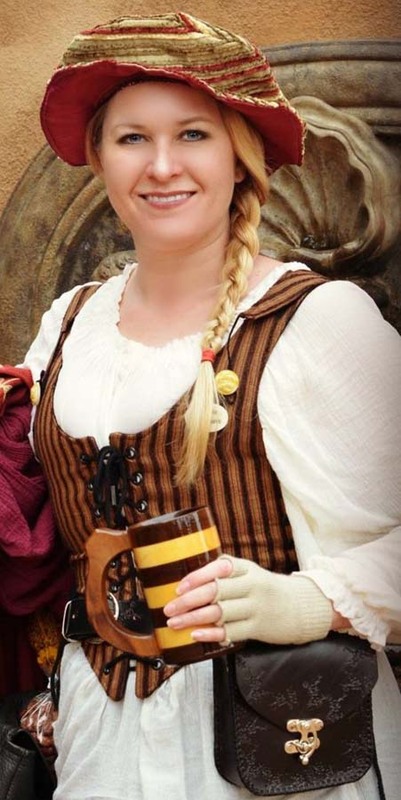 Peasant skirts and blouses are the foundation pieces for other themed costumes such as pirate, fairy, and steam punk with a few added accessories. Buy before you go to Faire! Full skirt – Buy or make a simple long skirt. The more accurate period skirts are made from natural fiber like cotton or linen and have a draw string waist. I prefer the less bulky elastic waist skirts. Skirts are a simple DIY project for beginner sewing! I have made several skirts and I have purchased a couple skirts on Etsy.com for less than the cost of fabric (many shops buy in bulk and pay wholesaler prices). I avoid buying skirts at the Faire, since they are typically double the price of any on-line shop! Chemise – This can be a shirt or long dress. The chemise shirt offers more options for other themed outfits. The long dress chemise functions as both skirt and blouse, and is a good way to save money when you are starting to build Renaissance costumes. I prefer white or cream chemise for basic peasant costume, or black chemise for pirate or steampunk. Sewing your own blouse is another great DIY project. Hat – Women would never leave the house without a little something to cover their head. A hat with brim covers your head, and provides shade for your face so you can ditch the (non-Renaissance) sunglasses. Simple muffin top and peasant hats are an inexpensive accessory for your costume. Pouch – A simple fabric drawstring pouch is a cheap and easy carry-all for your wallet (money & identification), car keys, and other lightweight items. Avoid the temptation to over-stuff your pouch! This is another fun DIY project that is great for beginners. Shoes – Custom made shoes from Faire are expensive and can have a long lead time for purchase. To save time and money use your imagination and buy off the rack. Check your local shoe store for simple rubber sole leather shoes. There are many inexpensive options for plain leather shoes (flats or slip on) in brown or black that you may never decide to spend the big bucks for custom shoes or boots. Often, only the tip of your toes can be seen under full length skirts. There is plenty of walking at Faire so make sure that your shoes are comfortable. Bodice – A simple bodice or waist cincher is usually the least expensive option, and fits in the peasant style of garb. This is one item that I prefer to buy in person at the shops at Faire rather than on-line, especially for beginners. 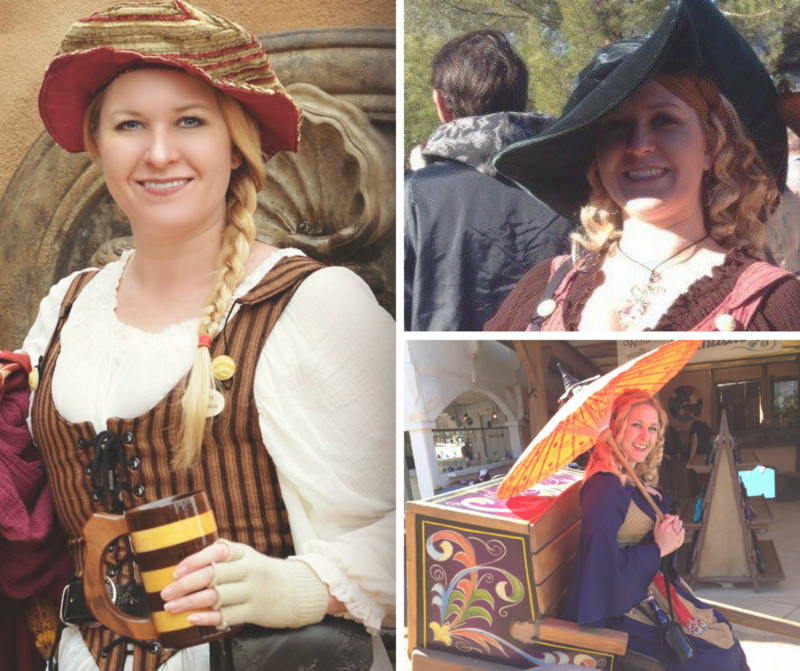 The shops at Faire will have a wide range of bodices, waist cinchers, and corsets in fabric and leather. Ask to be fitted for a bodice or corset on-site. The shop attendants are usually very knowledgeable and helpful to find a bodice or corset that you will love! Changing your bodice is the easiest (and least expensive) way to add variety in your Ren Faire wardrobe. Once you have assembled your basic outfit, here are a few other items that you may want to add to complete your look. Cotton Socks – Striped or silly socks are another way to stay warm and add a little whimsy to your outfit. Bloomers – Another layer for warmth and fun, wear a pair of ruffle bloomers under a full peasant skirt. Knit Gloves – Another accessory to keep you warm and comfortable at Faire. I always keep a pair of finger-less knit gloves in my leather pouch, just in case. Parasol – Usually an impulse item at Faire, parasols provide excellent shade strolling between shops. 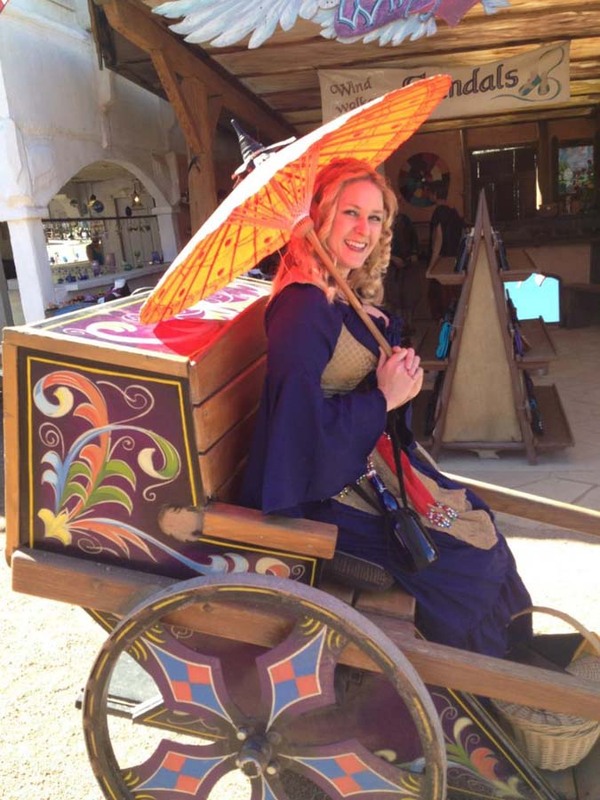 Faire merchants offer a wide variety of parasols and are worth buying on site to avoid a sunburn! Leather belt and bag – After a few Faire days, I ungraded my fabric pouch to a leather belt and bag set. Many leather shops will punch extra holes or shorten the belt, just ask! More bodices, corsets, and waist cinchers. Price usually reflects quality on corsets and bodices. Check the boning and stitching around the boning to ensure a well-made item. Adjustable side and back lacing makes for a better fit bodice, and will be more expensive. Start with one or two bodices/waist cinchers to determine your preferences for fit and style. After buying a dozen (more expensive bodices), I find that I really like (less expensive) waist cinchers with side and back lacing and slight boning for shape. Wooden mug (plus loop for belt) – There is something about drinking ale or cinder from a wooden mug! After many days at Faire, I was so envious of people with their own mugs. I purchased a tall stripe wood mug with handle, to wear on my belt loop. Jewelry – Many artisans at Faire will customize earrings, necklace, rings and more to your specific tastes. Cloak – The period perfect cold weather accessory is a cloak or hooded cape. Floor length or short cloak will keep you warm and protect against wind, rain, and snow. Better options are available online that what many shops at Faire may have in stock, but when you are cold this might be your favorite impulse purchase to continue enjoying your day at Faire! Fabric – Polyester (or poly blend) fabrics repel stains, but do not breathe as well so stick to cotton and linen for warmer weather Faires like Arizona, California, and Texas. I made the mistake of buying a long sleeve, polyester chemise dress. I was miserable and sweaty after wearing it once on a warm but not particularly windy day. 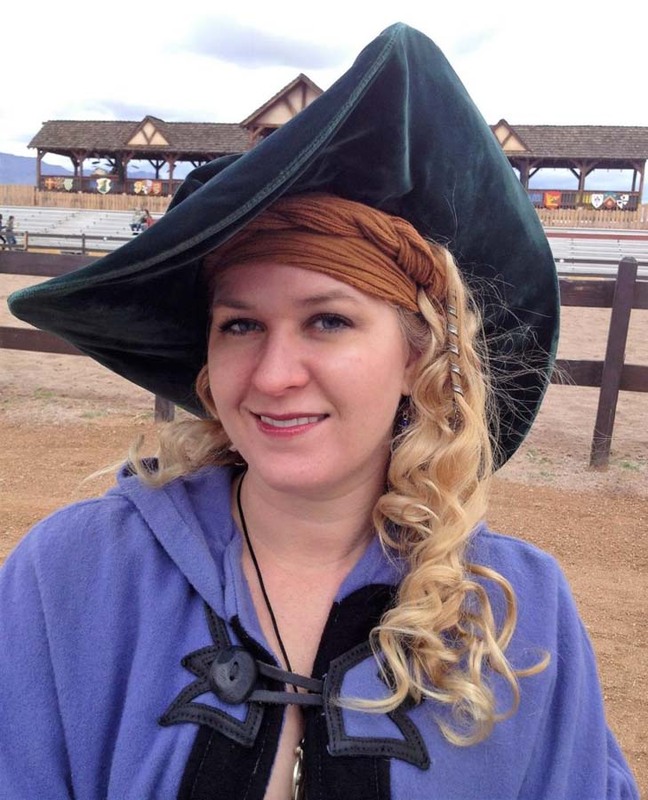 Host a Ren Faire garb swap party! A friend of mine invited several women over to bring Renaissance Faire clothes and accessories for swap, trade, or sell. Clothing that no longer fit was traded to friends for better fitting items and accessories. With enough people, we were able to coordinate swaps and various sales. One three way swap allowed a friend to trade in her Irish overdress and chemise for an (almost) new black leather bodice! This post contains affiliate links. This site may receive a commission on any sales made using these links at no additional cost to you. This is so fun! I’ve never ever been to a Renaissance fair before, but I know there is a big one in MA at some point each year. I definitely should check it out! I hope you go! It will be so much fun. This is a such a great guide! I have actually wanted to get into Larping. I am not sure if there are any groups around here. I imagine there are though. I will just have to search for them.